"This 14-inch pan is covered with durable stainless steel for fast, even heating." When it comes to frying pans, small ones are great for cooking a single egg or maybe two, but when you’re cooking for the whole family you need a lot more space. This 14-inch frying pan gives you enough room to cook burgers or pork chops or steaks for the family, while the stainless steel interior will give you a great sear. The polished starburst pattern inside helps keep food from sticking, and the flared sides make it easy to toss foods like a pro. This large pan is oven and broiler safe up to 600 degrees, so you can start cooking on the stove and finish in the oven, and it’s induction compatible. It has an aluminum core on the bottom and up the sides of the pan which is totally covered with durable stainless steel for fast, even heating and easy cleaning by hand or in the dishwasher. Cast iron frying pans have been much-loved for generations not only for how they cook, but also since they’re nearly indestructible. This pan comes pre-seasoned, so you can use it immediately, but it will become more nonstick with additional seasoning and continued use. The pan can be used on any cooktop, including induction, as well as in the oven, on a grill, or over a campfire. Cast iron has superior heat retention and even heating, but the downside is that the handle can become hot during cooking. This pan comes with a silicone handle cover that solves that problem​ and can be removed to use with other pans. As with most cast iron pans, it should be hand washed. This slope-sided pan has a hard anodized exterior and a proprietary Quantanium nonstick interior, and is built to last much longer than the nonstick pans you can pick up at the grocery store. The glass cover is useful for steaming foods while the drip-free rim makes it easy to pour liquids from the pan without creating a mess. The handles are designed to stay cool during cooking and are riveted on for security. The pan is oven-safe to 500 degrees and is approved to use with metal utensils. This 12-inch stainless steel pan resists pitting and staining and provides even heat distribution for less scorching. The lid fits snugly to keep moisture in, while the straight sides provide more surface area on the bottom of the pan. The handle is riveted on for security and is designed to stay cool during cooking. 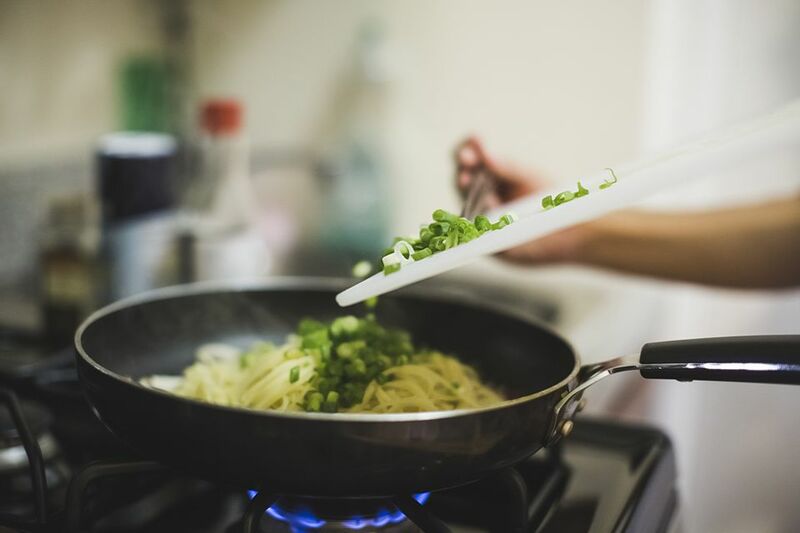 While stainless steel isn’t nonstick, heating the pan before adding the oil will help food release easier. This pan is oven-safe to 500 degrees and is dishwasher-safe for easy cleaning. Crepe pans are a special type of frying pan with very low sides, but you can certainly use them for more than crepes. They’re great for pancakes or eggs, and as a griddle pan for cooking any foods that won’t release a lot of moisture that could escape the low sides. The pan is made from aluminum, so it’s lightweight for flipping the crepes (if you want to), while the low sides make it easy to slide the crepes out of the pan if flipping isn’t your style. The nonstick surface ensures that crepes and other foods won’t stick, while the aluminum conducts heat evenly to prevent hot spots and burning. This pan has a soft-touch handle that is comfortable to hold and won’t get hot during cooking. The pan is dishwasher-safe for easy cleaning, but it is not induction compatible and should not be used in the oven. A deep skillet is handy for shallow-frying chicken, for making or reducing sauces, and for braising, while still being very capable of frying burgers, bacon, or chops. The exterior of this pan is an attractive bronze color and the comfortable grip on the riveted handle is color-coordinated. The heavy aluminum construction provides even heating and the pan is oven-safe to 400 degrees, so you can finish your food in the oven or use the pan for oven-braising. It’s also designed to withstand the heat needed to sear your steaks. The nonstick interior will not damage from the use of metal utensils, so you don’t need to worry about choosing the right spatula. The glass lid holds in steam and heat and lets you check the food while it cooks. Sloped sides make it easy to slide pancakes or omelets out of the pan, while also making it easy to flip foods. This pan should be hand washed. This skillet set includes both a 9 1/4-inch and an 11-inch skillet, so you’ll always have the right pan for the job, whether you’re cooking an egg or two for your own breakfast, or you’re frying a pound of bacon for the family. The modern yet rustic design will look at home in any kitchen. The nonstick interior is a warm espresso color, while the choice of exterior colors ensures you’ll find the one that’s perfect for your décor. These pans are made from aluminum for even heating and have a porcelain enamel exterior that can withstand heavy use. The handles have rubberized grips for a firm hold, and they are riveted on for safety. The pans are oven-safe to 400 degrees but are not induction compatible.